Do you wake up at night with a painful burning sensation in your throat? Do you suffer from a dry cough, sore throat, or an unexplained hoarseness throughout the day? Do you have a problem swallowing food comfortably? If you answered yes to any of these questions, you may be suffering from acid reflux or a hiatal hernia, a condition where acid from your stomach backs up into your esophagus, the tube that connects your throat to your stomach. There are many things that can cause acid reflux, like fatty or spicy foods, weight gain around the stomach area, and alcohol and nicotine. Changing your diet, losing weight and sleeping in an adjustable bed can help symptoms and offer relief from acid reflux problems. How Do Adjustable Beds Help? If you suffer from acid reflux, doctors recommend that you should sleep with your head elevated at least six inches above your feet and body. If your head is elevated, gravity helps keep food in your stomach and prevents it from entering your esophagus. When you're lying flat in the bed, gravity has no control. A bed that is adjustable makes it much easier to find a comfortable sleeping position with your head elevated. Using several pillows to elevate your head usually causes neck or back discomfort, and you often wake up with a sore or stiff neck. Positioning your head and other parts of your body can be done slowly and simply with the push of a button. 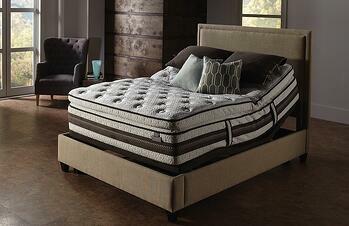 There are a variety of beds on the market with mattresses that range from soft to extra firm. They're available with manual and electric controls and many different sleep positions, so it's easy to find a comfortable sleeping position. Some top quality brands even come with heat and massage options. If you're suffering from acid reflux, consider an adjustable bed for quick, easy relief. A good night's sleep can change your life. Visit Land of Sleep at either of our two locations to find the perfect bed for you and start feeling better today.